This tutorial shows how to create a software release process with GKE, Helm, and Concourse. Helm is a tool to help you manage Kubernetes manifests. Concourse takes advantage of Helm to continuously deploy your applications. Two source code repositories, one for your application source code and another for your Helm chart. Your application, packaged as a Docker container and installed and configured as a Helm Chart in your cluster. You can push a Git tag to either of the two repositories to start a release. The following diagram outlines the system's high-level architecture. Concourse assembles continuous delivery pipelines that you can use to codify the steps of your build, test, and release processes. In Concourse, the stages of pipelines are called jobs. Each job can take a resource as an input and can create a resource as an output. You can use Helm to make your Kubernetes manifests into templates and then configure, install, and upgrade them as as a unit. You must define your application as a chart for Helm to install it. Each Helm chart has a values file that you can use to parameterize your manifests. For example, you might have a value that defines the Docker image to use for your application deployment. This value might change each time you install or upgrade your chart. Each installation of a chart is called a release. You use releases to upgrade or roll back an instance of your application. You can share charts by using a repository. In this tutorial, you create a private chart repository using Cloud Storage. In this tutorial, you build the continuous delivery pipeline shown in the following screenshot from Concourse. Inputs and outputs are shown in dark boxes. Pipeline jobs are shown in green boxes. As the screenshot shows, the build-image job takes the application source code (app-source) as an input. When a new tag is pushed to the application source code, Concourse runs the build-image job. The build process checks out the code, performs a Docker build, and then pushes the image to Container Registry, labeling it as an output in the pipeline called app-image. The application Docker image is an input to the next job in the pipeline, deploy-chart. The deploy-chart job also takes the chart source code (chart-source) as an input. Gets information about the application image, such as the repository and tag. Checks out the chart source code from Cloud Source Repositories. Packages the chart using the Helm client. Uploads the packaged chart to your private chart repository in Cloud Storage using the Helm plugin for Cloud Storage. Installs the chart in your GKE cluster using the Concourse Helm Resource, which is called dev-site in the previous screenshot. Open Cloud Shell, create a GKE cluster, and configure your identity and user management scheme. Download a sample application, then create a Git repository and upload it to Cloud Source Repositories. Use Helm to deploy Concourse to GKE. Configure a Concourse pipeline to install and update your application. Deploy a code change to your application to trigger the pipeline. Deploy a change to your Helm chart to roll it out to your cluster. Enable the GKE, Cloud Source Repositories, and Compute Engine APIs. Configure the infrastructure and identities that you need to complete the tutorial. Open Cloud Shell from Google Cloud Platform Console. You execute the rest of the tutorial from inside Cloud Shell. 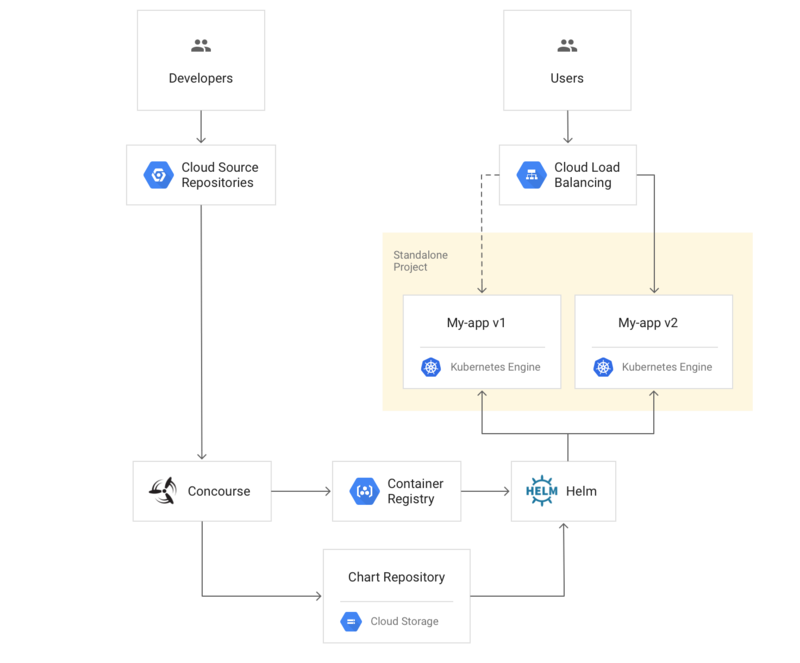 You need a cluster with the cloud-source-repos-ro and storage-full scopes so that your Concourse pods can download your source code, push images, and upload charts to the Cloud Storage chart repository. Use Helm to deploy Concourse from the Charts repository. Ensure your user account has the cluster-admin role in your cluster. Create a service account that Tiller, the server side of Helm, can use for deploying your charts. You see output similar to the following. If Helm is correctly installed, v2.6.2 appears for both client and server. If you see a message that Helm couldn't contact the Tiller process, wait a short while and then try again. It can take Tiller up to 2 minutes to initialize. printf "Concourse URL: [http://$SERVICE_IP:8080]\nUsername: concourse\nPassword: $PASSWORD\n"
This command outputs a URL, username, and password. In your browser, go to the URL from the previous command. This takes you to Concourse. In Concourse, click the login button in the top right corner, and then click main. Log in with the username and password from the previous command. You create a Cloud Identity Access Management (Cloud IAM) service account to permit Concourse to push images to Container Registry. Download the service account key. In a later step, you install Concourse and upload this key to GKE. In this section, you create your source code repositories, configure and create your pipeline, deploy your application, change it, and then deploy it again. In this tutorial, you use two repositories, one for handling application source code and the other for the source code that defines your Helm chart. Changes to either of these repositories will update your deployment. Set the username and email address for your Git commits in these repositories. Replace [EMAIL_ADDRESS] with your Git email address, and replace [USERNAME] with your Git username. git config --global user.email "[EMAIL_ADDRESS]"
git config --global user.name "[USERNAME]"
Concourse allows you to interpolate parameters into your pipelines. You use this functionality to parameterize your pipeline as well as to inject secrets that you don't want checked into your source code repository. Refresh Concourse in your browser. The pipeline is configured to be triggered when a Git tag is pushed to either the application or chart source code repository. Push the first tags in each repository to deploy your application for the first time. Next, you make a change to the chart configuration to trigger an update. 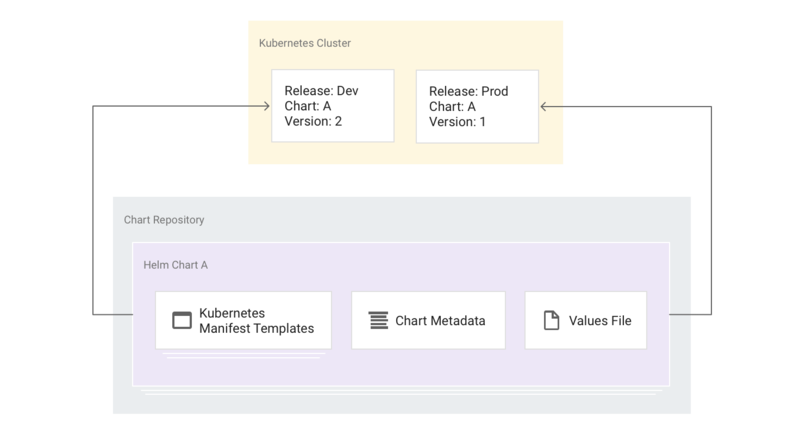 The chart definition contains a Kubernetes Config Map that defines your application's default page. You update that Config Map to make a change to the application's index page. In Concourse, your pipeline starts from the chart deployment job. The following steps remove all resources created by this tutorial so that you don't incur unnecessary charges. Learn about Continuous Deployment with Jenkins. Learn about Deploying Spinnaker to Compute Engine. Deploy Jenkins to Kubernetes Engine. Use Spinnaker with Ansible to Do Continuous Delivery.